2015 World Series Baseball - Game Model | Sports Memorabilia! This is the Rawlings Official Game Ball model as used on field in the 2015 World Series between the New York Mets and the Kansas City Royals. 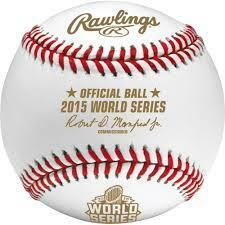 The 2015 World Series Baseball has red stitching and gold printing on the white panels. Each leather ball comes wrapped in tissue in a box and has the official 2015 World Series gold logo engraved on it. This is a great looking baseball and perfect for autographs by the 2015 Mets and Royals or as a sports collectible by itself! The Royals won their first World Series championship since 1985 and second overall. Salvador Perez was named MVP of the series. Call for price breaks for 12 or more.